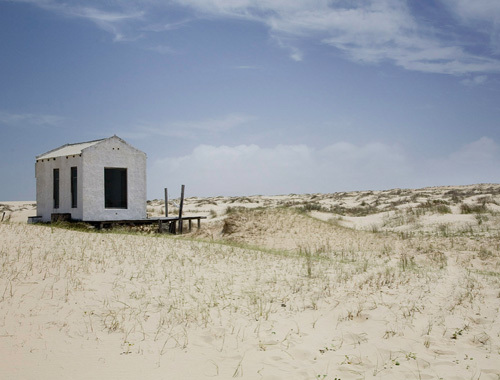 This house is located in the dunes of Cabo Polonio on the eastern coast of Uruguay. It is small, fitting only two people. The materials used for building are very simple, like those of all the houses in Cabo Polonio. 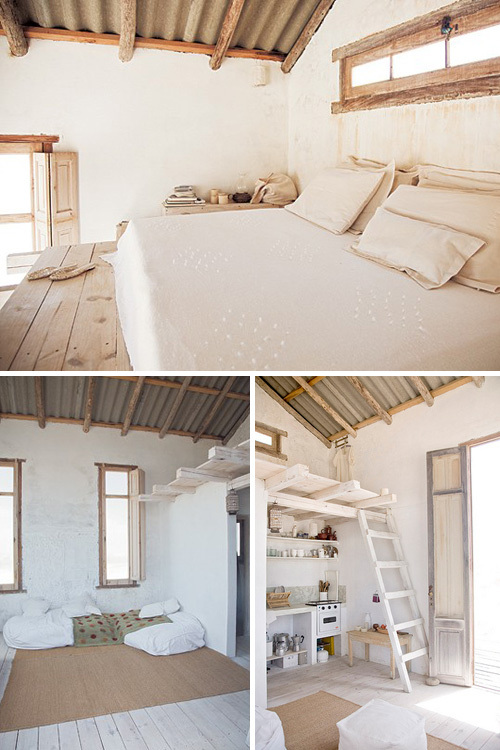 Also the interior is simple with whitewashed walls and floors. The main color is white with accessories in earthy tones. True to the spirit of the inhabitants in the area, the house remains without electricity using lanterns and candles. Cabo Polonio have no direct road, you need to take a special transportation that brings you there after going through the dunes surrounding the town. There´s no electricity and no cars. It´s the perfect place to get lost for some days. I love to see how simple houses could be also be very cozy and functional. It seems to be a great house to stay during spring or autumn there (not too hot and not too cold!). Merciiii Daniele… it’s just exactly the guest house project I drew last time for my french southern Bastide… let’s see in few months for the result!!! I´m from Uruguay! I always check this web, I realy like it, congrats and tks for share we us all this nice things. Cabo Polonio is one of the most beautiful places I have ever been. It´s where I used to stay on my vacations and let me tell you, Cabo it´s the meaning of been disconected. Karen, the roof might not be the healthier, but been sorounded by many computers, cars, smoke, bad food and stress, like all of us probably live our lifes all the time, it´s not healthy eather. In Cabo there´s no electricity, no cars, just sea, sand, sun and nice people playing instruments under the stars at night and sharing nice moments. You are totally welcome to my country. @Lau: looking forward to see pics of your french bastide! @Jenny: thanks for the information! cabo polonio seems like a perfect place to escape from hectic life for a while..
Yeah… I don’t think you can get cancer from staying there for a few day’s, I would love to be there right now! P.S. you can get cancer from a lot thing’s. This is so sweet and lovely. I might even risk my life for a stay. 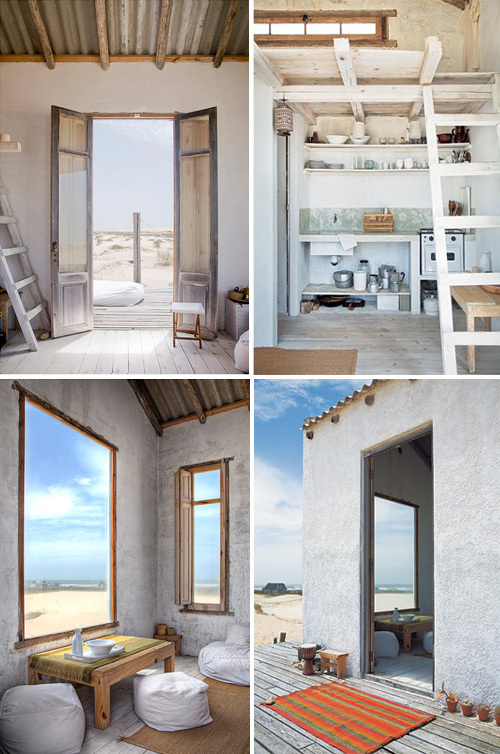 For the cabin in cabot polonio Uruguay? I’m heading down there & it looks so lovely! I’d love to rent it. Looks beautiful and serene…not sure how much we will enjoy after living in a world of gadgets! We are in pedrera and we woul’d like to rent your lovely house for fews days. It’s can be the 19 january to the 26 or less. We are designer and decorator for movie from montreal. We will take take care of your place. Coul’d you anwser soon as possible. We want to be there tomorrow!